Over the past couple of years the 49ers have been a dysfunctional organization. They’ve forced out a successful head coach, hired a successor who proved to be in over his head and sent all sorts of mixed messages about the balance of power within the organization. Jim Tomsula was given votes of confidence as head coach but then let go after just one very rough season. Now it appears there may be more of the same in store for 49ers fans. 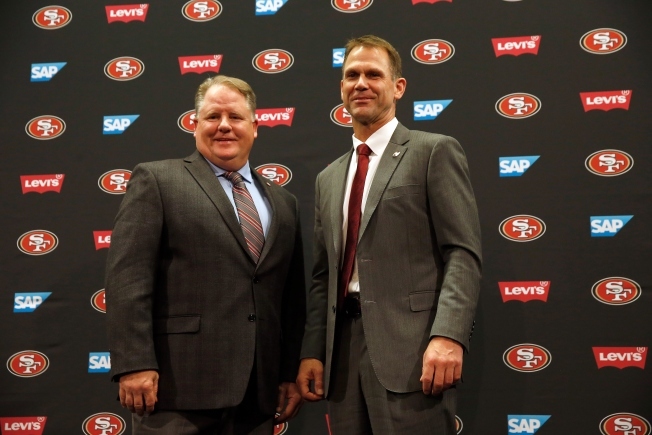 Though a new head coach, Chip Kelly, is in place and Kelly and general manager Trent Baalke insist they have good communication with each other and with all other members of the organization, communication looked anything but good on Thursday. Once again, the 49ers were sending out mixed messages. At the NFL Combine in Indianapolis this week, both Kelly and Baalke insisted that quarterback Colin Kaepernick wants to stay with the team. Kelly also said he’s eager to see what Kaepernick can do this season. Baalke, too, told the media this week that he expected Kaepernick to be with the team in early April for the beginning of its offseason training program. But a different message came out of the Kaepernick camp Thursday that contradicted Kelly and Baalke. The NFL Network’s Rand Getlin, citing a source, reported that Kaepernick’s agents have requested permission from the 49ers to seek a trade. Ian Rapoport of the NFL Network reported the team has not yet granted that request. “How will the 49ers respond?” he wrote. “Have they been talking up their attachment to Kaepernick publicly as leverage to trade talks that they suspected were coming? He was one of the NFL’s most ineffective starters in 2015, is coming off surgery and has a sizable contract. So far, Kaepernick has been silent publicly about his wishes. But the whole mixed-message scenario is a familiar one, says longtime columnist Tim Kawakami of the Bay Area News Group.